Welcome to ClockShark's Help page on reviewing and editing employee timesheets! In this article, you will learn how to find and (if needed) fix employee timesheets from both the Administrative Website and the Mobile App. Since reviewing timesheets and making appropriate corrections might be the most important step before processing company payroll, this article is a great reference and resource for you as you work in ClockShark. Oh, and if you're looking for how to approve time sheets... visit this help article. Now, let's get started! 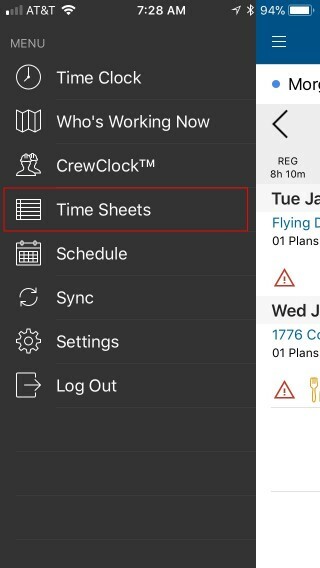 After employees clock in and out from either the mobile app or the web, you can view and edit their times in the Time Sheets screen, which is accessed from the main menu. On the Time Sheets Screen, you will see a time sheet for each employee for each day worked. On the time card you will see a total number of hours worked for each day for each employee, the start time for the day, the end time for the day, as well as a list of the jobs worked on. 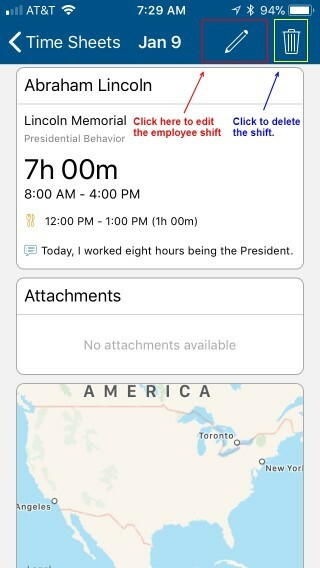 If notes have been added to the shift, you will see the Notes icon on the time card. 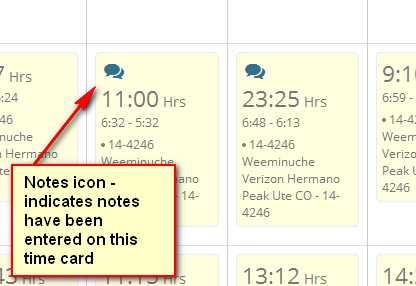 If the shift has been previously edited, you will see the Edited icon on the time card. 1. Employee forgets to clock out (shifts are automatically ended after 23+ hours when an employee forgets to clock out). 2. Employee is scheduled for a particular time, but clocks in more than 15 minutes early. 3. Employee is scheduled for a particular time, but clocks out more than 15 minutes late. 4. Employee is scheduled for a particular time, but clocks in more than 15 minutes late. 5. Employee is scheduled for a particular time, but clocks out more than 15 minutes early. 5. Employee clocks in for work, but is not scheduled. 6 .Employee is scheduled, but does not clock in. Note- Each of these exception conditions is optional and can be switched on/off from your Notifications page, located under [Admin] > [Notifications]. 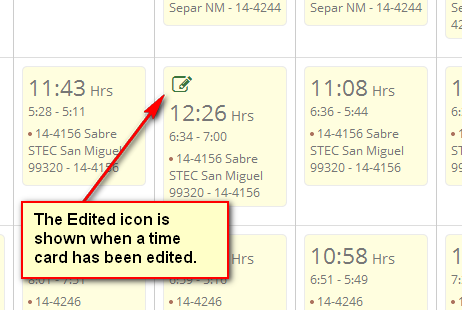 When a shift exception exists on a time card, the Exception icon will be displayed on the time card. To view a time card's details (or to edit the time card), simply click on the time card to go to the time card detail view. From the time card detail view, you can add time, edit time, edit job and task codes, view notes, add notes, as well as delete time. Any changes made to a time card will be permanently recorded for security purposes in your Audit Log. You can also view the GPS location of each punch event. By clicking on the GPS map icons you can view the detail of each punch location. If you are using facial recognition, you can also view the employee's picture from the timesheets screen. If the wrong face was detected, you will see a red alert below the time segment. 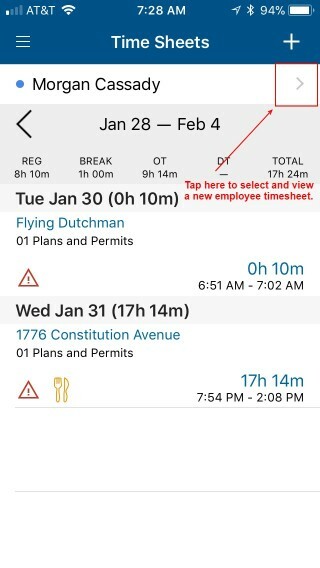 To view an employee's timesheet, first open the app and press the Menu > Time Sheets button. Once you have selected the Time Sheets button, the app will present you with your timesheet first. 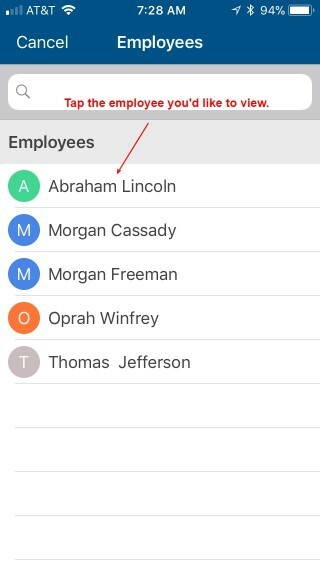 To change the view, just press your name to reveal the list of employees whose timesheets you can view. 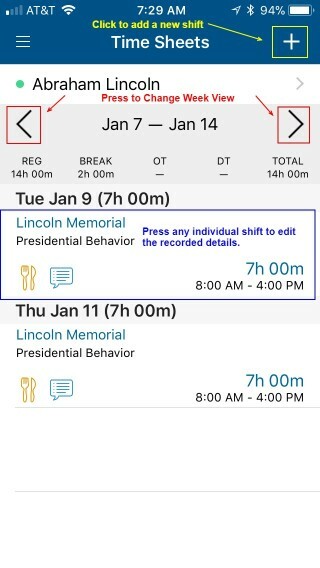 In this example, the user Morgan sees their timesheet first, but by pressing the carat in the top right, is able to choose a new employee to view. From the list of employees on the following screen, now choose the employee who's timesheet you'd like to view. Below, the user is selecting Abraham Lincoln. Once the employee has been selected, the screen will now show the employee's timesheet. On this screen, you can toggle the dates to see past hours the employee has worked. At any point, you may press an individual shift and edit it. You can also insert a new shift by pressing the "+" button in the top right. Just like the webiste, icons appear on the shifts to indicate whether an employee has taken a lunch, left notes, or inserted an attachment. Pressing the shift line item will reveal the shift details on a new screen. 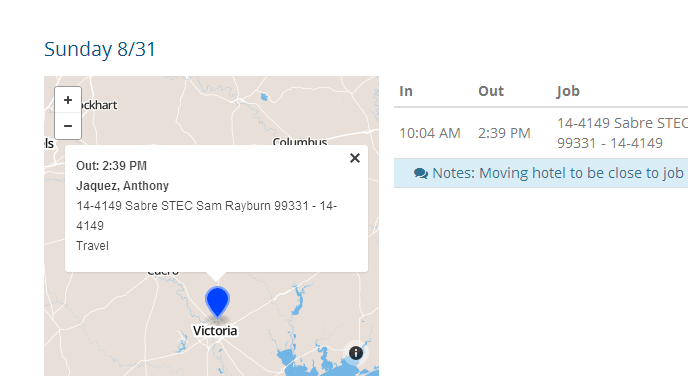 To view a different employee's timesheet, just hit your "Back" button until you return to your root timesheets screen where you can select a new employee. Thanks for taking the time to read about how to view and edit employee time from both the Website and the Mobile app. Whether you're in the office or on-the-go, ClockShark provides two ways to make sure the important job of verifying timesheets is easy for you to do!